Deadline was the first to report on the news. According to their sources, Chinese American screenwriter Dave Callaham will write the script for the title character. The studio is currently looking at Asian and Asian-American directors to helm the film. This is an effort that mirrors that of Black Panther. That film featured a large all-black ensemble and infused black themes and stories within a comic book film. It was directed by Ryan Coogler, who co-wrote the script with Joe Robert Cole. Marvel Studios hopes to do what they did in Black Panther with the Shang-Chi movie: tell Asian and Asian American stories with Asian and Asian Americans telling those stories. Crazy Rich Asians did something similar to that but for the romantic comedy genre. It’s pretty clear that Marvel Studios is interested in telling more diverse stories and are reaching into the deep vault of superheroes and villains to tell those stories. Not only that, but they want the right people to tell those stories. Callaham, is pretty well-known within the superhero movie world. He co-wrote Wonder Woman 1984 with Patty Jenkins and Geoff Johns. Additionally, he will be tasked with writing the sequel to Spider-Man: Into The Spider-Verse. Outside of the superhero realm, he also wrote the scripts for The Expendables, Zombieland 2, and the story for Legendary’s Godzilla. 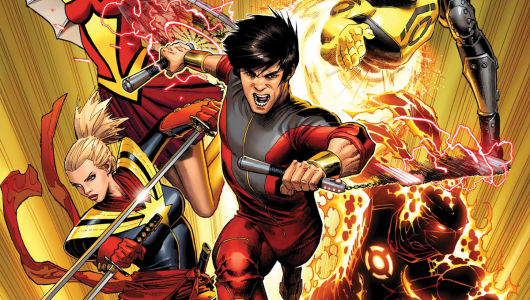 A Shang-Chi movie would be another addition to Marvel Studios’ long line of diverse titles. As aforementioned, Coogler and Cole are credited with Black Panther. New Zealand-born director Taika Waititi was behind Thor: Ragnarok. Ant-Man and the Wasp is the first time that a female superhero shares a title billing with a male superhero. Then there’s Captain Marvel directors Anna Boden and Ryan Fleck. Upcoming films include The Eternals, which will be directed by Chloé Zhao; and Black Widow starring Scarlett Johansson, which will be directed by Cate Shortland using a script written by Jac Schaeffer.